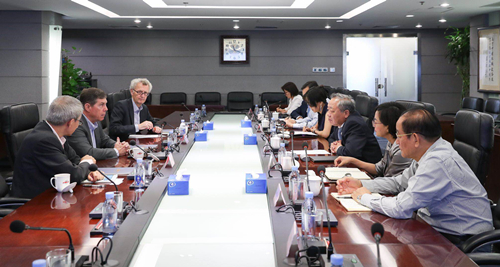 On the morning of September 4, 2018, CMEC Assistant General Manager Wang Yili met at CMEC with the delegation headed by Paul Hanrahan, CEO of Globeleq. The two sides exchanged views on sustainable development in the field of electricity on the African continent. Paul Hanrahan said that Globeleq is an important investor, developer, owner and operator of African electric power projects, owns, operates and has invested in eight electric power projects in Tanzania, South Africa, Cote d'Ivoire, Cameroon, and Kenya, and has rich experience in investment and powerful strength of investment. Wang welcomed the Paul Hanrahan and pointed out that CMEC has a proven track record of and rich experience in project operation in Africa, and EPC is a traditional advantage of CMEC. He hoped that in the future cooperation the two sides give play to their respective advantages, make joint efforts to develop gas, wind power, solar energy and hydropower projects in Africa, and establish an effective model for mutual benefits and collaboration. At the meeting, the two sides made in-depth communications on key possible cooperation projects. Also present at the meeting were relevant personnel from the 8th business unit.